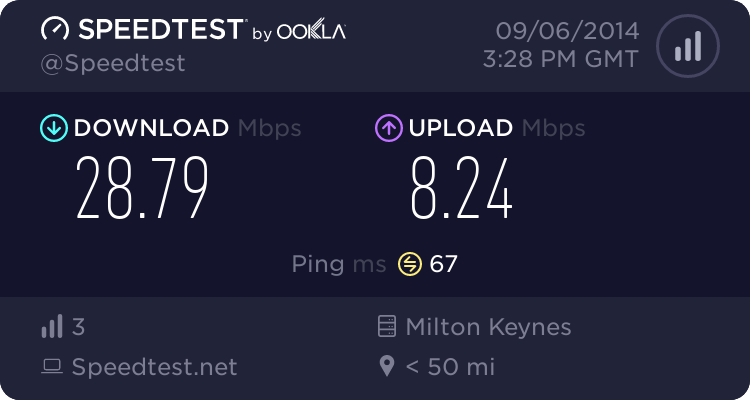 Hello all,Just signed up for ripwire in oxspring village, heretofore the recipient of massive 1-2Mb ADSL internet speeds, and am awaiting connection on tuesday. 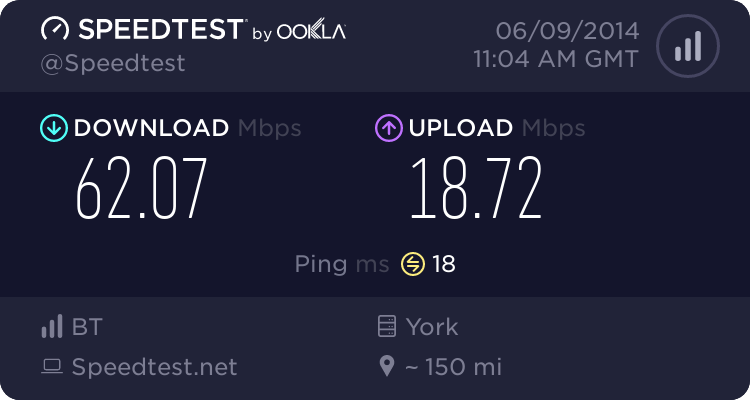 Have just been reading all of the problems people have had, and I'm slightly apprehensive that I'm going to be weeks sorting out setup problems and am going to regret ditching my BT trouble-free, albeit slow, ADSL. 1). The Cellpipe modem that has arrived has its wifi and LAN 2,3,4 ports disabled by the supplier apparently. Any idea why? Some govt THALES contract thing? 2). Can I not just go into configuration settings and enable all of that, or it soldering of wires required, or is there some known issue with the cellpipe kit's wifi and is the best idea to just go and buy a cable wireless router to connect to the modem? 3). Does the VDSL modem have to be connected to the BT master socket, or can it be connected to any socket in the house? As with most people, my master socket is down near the skirting in the hall, and my office is a bedroom upstairs which I've sent an extension to. 4). I presume ADSL and VDSL filters are different, and I'll need new VDSL filters for my sky boxes, etc? 5). Does everyone suffer the disconnection with phonecalls thing, or is that a known issue with a straightforward fix now? 6). I still have time to cancel and wait till BT infinity comes next year - would you still recommend ripwire after your problems? 1: We don't know the official reason as to why they are locked but one would assume Thales don't want the messing. In some respects I like it this way because me working as a faults analyst at Plusnet gets a tad annoyed when folk are putting router stats everywhere. RiPWire has said Thales have ran tests to remove this restirction and could be in the works. 2: The Cellpipe wireless along with the 3 other ethernet ports are disabled by default. You can't enable them as it required level 14 access..something that even Ripwire don't have the access to...the idea is that the Cellpipe is in bridged mode and you just connect a cable router up to it. For the sake of example a Netgear WNR2000...can be got for about £20 new on ebay. 3: The Cellpipe doesn't HAVE to be connected to the Master BT socket, however, it is preferred as extension wiring can kill your connection in terms of access speeds which then has a knock on effect on your speeds. What you could do is run a lan connection via HomePlug technology. They are about £40 for a pair, but well worth it. 4: Nope, all they are is plain ADSL filters. People have the idea that because its a Fibre to the cabinet connection, the connection itself goes to the house different. All Fibre does really is squeeze more tones out of the line creating a higher signal creating more speed so normal ADSL fliters will do. 5: A guy at work has just gone live with RipWire and he hasn't had any issues. I think Liam Winder, the CEO of the company said it best, "there will always be teething problems at the start". This is what he said to me in an email. If you do get such an issue, we have a small community here and also there is a small contigent on the Sheffield Forums which help too. 6: I'm in a 12 month contract with RipWire so its not so bad. I understand now that they only do 18 months. Would I still reccommend Ripwire...As it currently stands yes on the basis that none of the network is throttled, theres plenty of bandwidth so very little, if no congestion, currently totally unlimited and a competitive price to go with it. I will consider the BT Wholesale Fibre offering next year simply because I can get free Staff broadband at Plusnet, but when you consider the fibre packages out there of any ISP to Ripwires offering. It's hard not to choose Ripwire. What you have to consider is that Fibre is a new technology so its not going to be perfect whoever your with but i'm 110% sure you will be happy that you made the jump!. Hope this helps!. Many thanks for your detailed replies. Getting connected today, so will let you know how it goes! Hope everything went smoothly Stripey!. Went like a dream! Got an ASUS router - with a print server while I was at it. Ripwire connected with no setup glitches at all. I'm on an extended socket upstairs, and I'm still getting 20Mb download and 1.8Mb upload speeds. No probs with incoming calls on the phone, so I'm delighted! Many thanks for advice! Glad everything came out alright for you!. What package are you on...option 1?.